grandma's cookie jar: just for fun - It Is Chocolate Cake Day - Let's Celebrate!!! 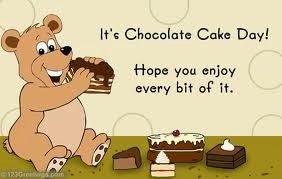 just for fun - It Is Chocolate Cake Day - Let's Celebrate!!! It is cold and snowy outside today, so I am extremely happy to say it is Chocolate Cake Day! What could be a better way to brighten a grey, cold and snowy day, than with a piece of chocolate cake?!!! Even if it was not Chocolate Cake Day, it would still be a great way to brighten this day . . . but it is!!! So, let's celebrate! I found the following information on punchbowl (dot) com about Chocolate Cake Day . 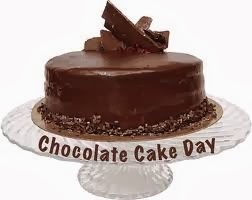 . . "Today is National Chocolate Cake Day! Cakes have a rich culinary history. In Greece, cakes (or “plakous”) were heavy and flat, and people served them with nuts and honey. The Romans made cakes which were more like cheesecake or pastry, and presented them as offerings to the gods. In Medieval England, people used the words 'bread' and 'cake' interchangeably to refer to anything made with flour dough." "A company called O. Duff and Sons created the first boxed cake mix in the late 1920s. In 1947, after years of research and development, General Mills released the first 'just add water' Betty Crocker cake mixes. The available flavors were Ginger, Spice, Yellow, and White. In 1948, Pillsbury introduced the first chocolate cake mix. including Black Forest, Devil’s Food, Flourless, Fudge, Ganache, German Chocolate, Lava, and much more. Head to your local bakery or whip up your favorite recipe to celebrate National Chocolate Cake Day!" I'm very happy to share with you my favorite recipe for the best-ever Chocolate cake! You'll find it at this link. Chocolate Cake Day is definitely a fun and tasty day to celebrate with your grandchildren! Have them help you make . . . and of course, eat, a chocolate cake! You could also consider making an extra cake in a 13x9 pan and then cut it into quarters - or at least in half. Have your grandchildren help you decorate the cakes and then take them to your neighbors to brighten their day on Chocolate Cake Day! I found the following "fun facts" about chocolate cake and thought it would be fun to share them with you . . . According to the Dover Post, chocolate cake was born in 1765 when a doctor and a chocolate maker teamed up in an old mill. They ground up cocoa beans between huge millstones to make a thick syrup. The liquid was poured into molds shaped like cakes, which were meant to be transformed into a beverage. Years later, a special dessert was created for a prince in the 1800′s by an Austrian chef. He used two layers of chocolate dough with jam spread in the middle. Chocolate frosting was then poured over the dessert. Hence the birth of the chocolate cake!! The earliest chocolate cakes were actually yellow cakes with chocolate icing - after this, people began eating chocolate and they ended up making chocolate bars! There are three objectives of Chocolate Cake Day: To bake a chocolate cake. To decorate a chocolate cake. And, to eat a chocolate cake. Of course, if you are too busy to bake or decorate a cake, then just eating a chocolate cake will certainly do! So . . . which "fun fact" did you find to be the most surprising? I thought the one about the first chocolate "cake" made by the Austrian chef was interesting, but I certainly agree with the three "objectives" for Chocolate Cake Day!